Through Vision Impact Liberia you have the opportunity to impact every Liberian with the salvation message of Jesus Christ; to take His word to the poor, the widow, the orphan and the outcast of Liberia by the means God makes possible. 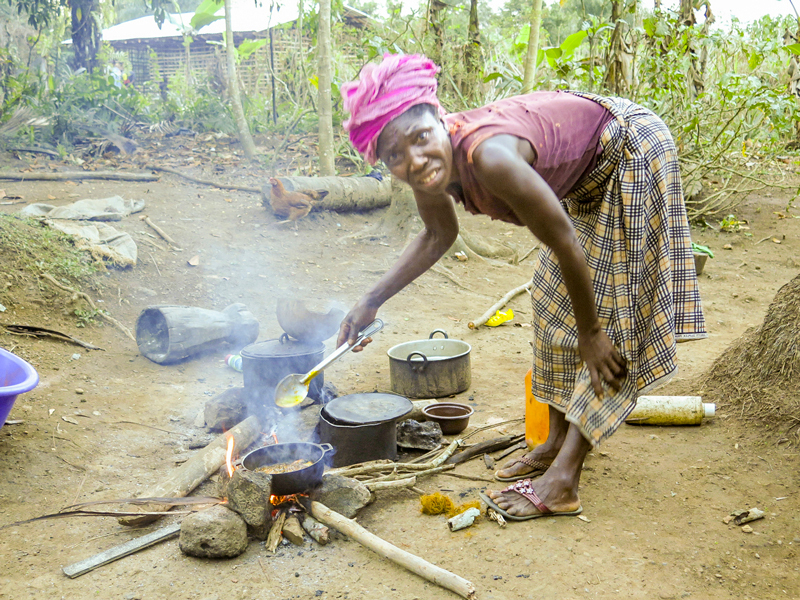 Vision Impact Liberia complies with Canadian Revenue Agency guidelines for non-profits through our relationship with International Christian Mission Services. ICMS has direction and control of the resources donated to ICMS on behalf of our ministry and holds us accountable for the work we do. In this video, Gary Janzen, the Executive Director of International Christian Mission Services, explains the relationship of Vision Impact Liberia with the Canada Revenue Agency through them, and the financial pathway of donations requiring a CRA, end of fiscal year, tax receipts. ICMS is our tax receipt writer and liaison with the Revenue Canada Agency. God’s faithfulness in the past encourages us today. We are asking the Lord to put on people’s hearts what part they are to have in this ministry. We give God praise for the financial support that comes in to enable us to initiate and complete projects for the people of Liberia. The office needs water delivered to the water tower for toilets and hand washing, janitorial supplies and paper and ink for printers. Pastor Eric has no other income and his needs include, food/water, electricity for his fan, lights and computer, internet, water to bathe, phone cards and fuel for the ministry vehicle. He depends on God for these daily needs. QUESTIONS? You can call ICMS directly at : 1-604-850-1817 DONATIONS MAY ALSO BE MADE BY VISA OR MASTERCARD – include number and signature + expiry date of your card and mail to the above address. Tax Receipts to CANADIANS & AMERICANS will be mailed to the donors at the end of February each year. For questions regarding giving to Vision Impact Liberia or enquiries regarding our policies please email Helen at: h-fletcher@shaw.ca or call her at: 250-595-2881 or 250-480-6848 for clear directions and safe transactions. The donate button will direct you to the “International Christian Missions Services” website. There you can select Vision Impact Liberia Society from the Agency scroll down menu and then follow the payment process. Please scroll down to read our Accountability and Responsibility Framework within the Ministry. The donations from a dear couple from Ontario, Canada paid for 4 wells. 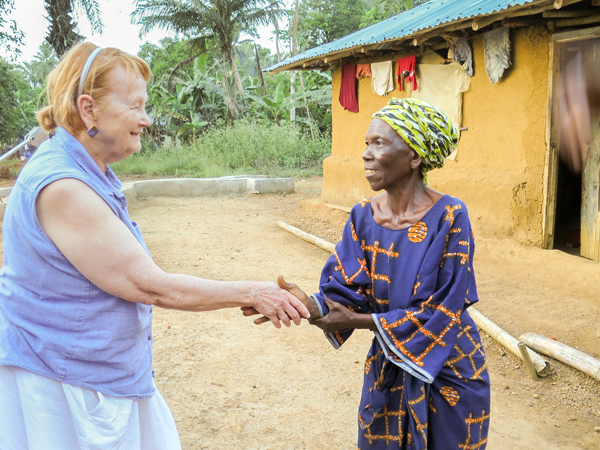 Their gifts have provided safe and clean water to serve about 12,000 villagers who live in the interior of Liberia. Thank you for these great gifts ! 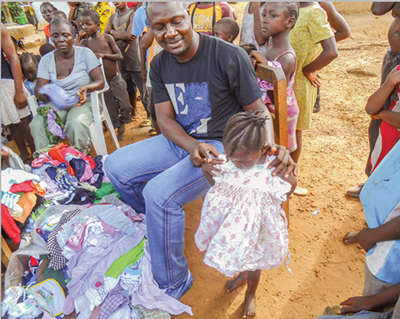 Due to the generosity of people like you bags of donated clothes are distributed at the Omega Orphanage in Bomi County; Pastor Eric has found a dress for a little princess. 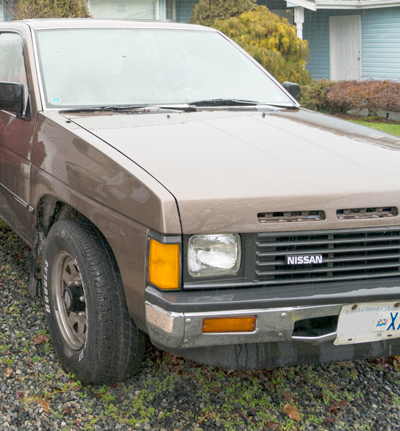 This pick-up truck was donated to Village Ministries (now Vision Impact Liberia) to be sold for funds for the general fund. 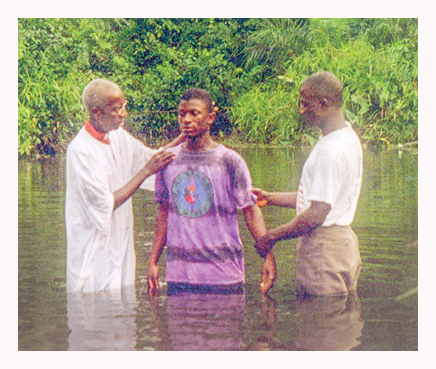 It was indeed sold at a good price and the money was sent to Liberia.
. . . and most important of all; donations are enabling the preaching of the Gospel with Liberians coming to know Christ and with fellowships being established even in Muslim villages. 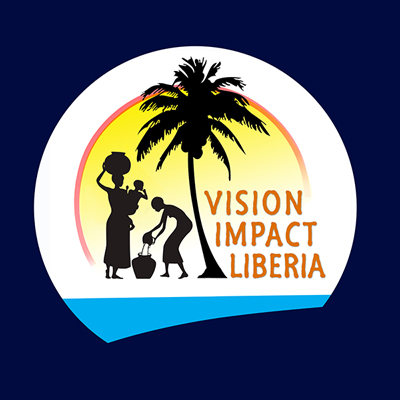 Firstly, Vision Impact Liberia Society is accountable to God who has called us to teach the Gospel of Jesus Christ in Liberia; who sees all and knows all that we do. Everything we have, including the funds, belongs to God and the health of our personal relationship with Him cannot be broken by mismanagement of what is His. Pastor Eric Sumo is responsible to direct and develop the ministry work in Liberia, West Africa and with Helen Fletcher to manage the choice of ministry and the financial income and outlay of ministry donations. 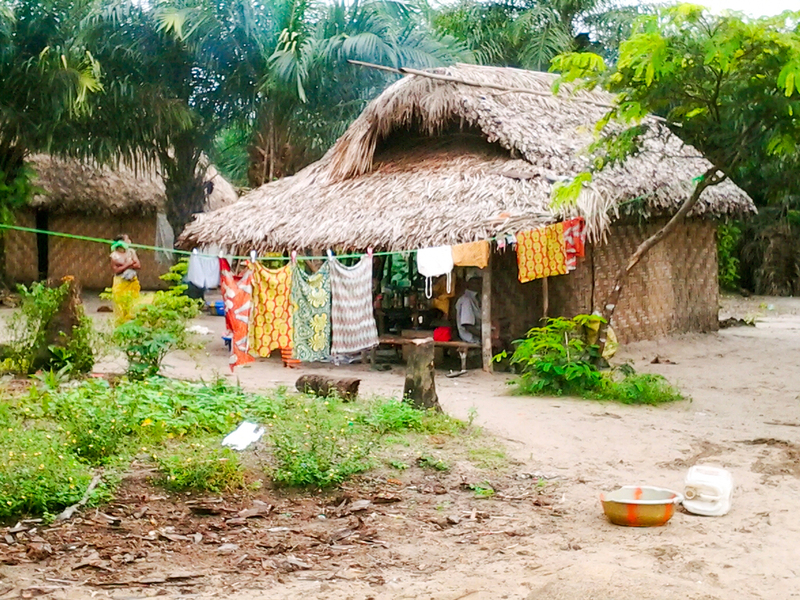 Vision Impact Liberia Society (V.I.L.S) is an agent of the charity ICMS (International Christian Missions Services.) V.I.L.S is responsible to send quarterly ministerial and financial reports to I.C.M.S to show how the donations were actually applied according to the mandate that V.I.L.S has with Revenue Canada. I.C.M.S holds these reports for Revenue Canada inspection. V.I.L.S is under an agency agreement with I.C.M.S which includes I.C.M.S writing tax receipts for V.I.L.S donors from Canada and the USA. Vision Impact Liberia Society has a eight member Board in Victoria, B.C. Canada which receives reports from the work in Liberia covering ministry, finance and prayer needs and maintains minutes of the V.I.L.S Board meetings. V.I.L.S policies and procedures are reviewed annually. The V.I.L.S Board promotes Pastor Sumo’s ministry and the needs of Liberians and also raises funds for the work V.I.L.S carries out in that country. How precious O God is Your unfailing love, we find refuge in the shadow of your wings, we feast in the abundance of Your house and drink from Your river of delights. For in You is the fountain of life; in your light we see light.